Euratex are proud to be offering the largest range of explosion protection products in the United Kingdom. From explosion vent panels, flameless vents and explosion barrier valves, to more specialised protection and rapid acting valves/systems. Select the type of protection you are looking for and see our solutions. If you would like to receive a quote for one or more of our products, simply head over to our contact us page. Explosion Venting is regarded as the most cost-effective form of explosion protection. When venting to a safe area is not an option, flameless venting is the solution. Isolate the explosion so it cannot travel through to other parts of the process. A reliable system to mitigate the effects of an explosion in process vessels, pipes and ducts. Detecting sparks in a contained vessel and applying an extinguishing system to limit risk. PAGE COMING SOON.. Contact Euratex to find out more about the services we provide. Need help identifying the correct equipment for your application? If you are unsure about the protection requirements for your application, try following our flowchart. The first step to safeguarding your plant is knowing what the hazards are. We offer DSEAR Risk Assessments, 3D Hazardous Area Mapping and Dust Classification via an accredited laboratory, to help you understand all the risks involved. 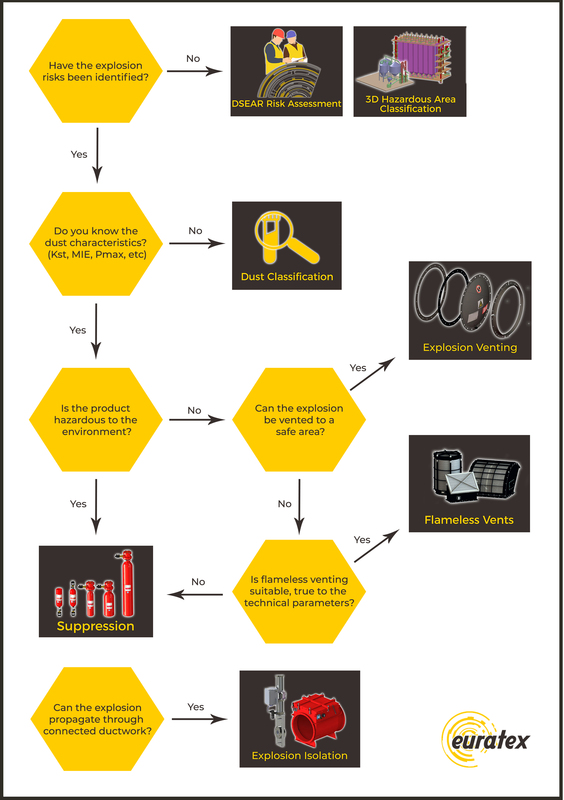 From there, we use ATEX design tools to determine the most suitable form of protection for your needs. Contact us today to receive a quote and find the right explosion protection solution. Try the yellow chat icon at the bottom right of your screen to get in contact fast, or you can see our contact page here.